This is intended for moms as you prepare a ceremony to mark this special time in your daughters’ lives. 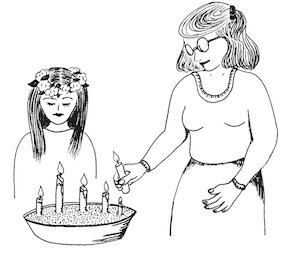 It contains a variety of suggestions for creating rituals that are appropriate for you, your daughters, and your community. 1) Creating and entering a holy space for the ritual. That is, leaving the mundane for the sacred. 2) Invoking the spiritual realm. 3) Building the energy of the ritual. 4) Heart, or high point, of the ritual. 5) Allowing the energy to subside. 7) Sharing food and friendship. The ritual that you create for your daughter should be fun for both of you and for your community of women. So approach this project with a light heart as you choose prayers, songs, and activities that are comfortable for everyone. Choose a comfortable location and create a sacred feeling in whatever way feels comfortable to you and your family. If your ritual is indoors, it is a good idea to turn off the phone ringer and put “Do Not Disturb” signs on the doors. Light candles or incense, play soft music or drum softly, read poetry or sit in silence. Creating an altar is a common way to create a sacred space. Altars help us remember and focus on what is meaningful for us. The objects on the altar are symbolic of the theme of the ritual. On a first moon-time ritual altar we may have symbols of the Earth, pictures or statues of great or holy women or pictures of women family members. Flowers and other decorations are welcome. A flower crown or garland, which will be worn by the “New Woman,” can be on the altar. Another way to create a sacred space is to make a circle with a red rope. Our community of women has a nylon rope, dyed red, which is used at many community rituals. This step involves purifying our minds and hearts of daily concerns. It is the intent that is important. You can burn incense, or sprinkle everyone with water, or throw flower petals all around the ritual place—whatever feels to you like purifying the environment. Smudging is one way to leave behind the cares of daily life. It symbolizes cleaning off negative energy and preparing for the sacred ritual. You can buy smudge sticks at most food co-ops, natural food stores, or stores that sell herbs. Or pick some herbs from your garden, wind cotton string around them to form a “stick” a few inches long and one to three inches in diameter. Hang the herb stick in a warm place and allow it to dry for two to four weeks. At your moon-time ritual, light the stick and “smudge” each other or yourself by letting the smoke drift around the body. Ritual seating is another way to separate ourselves from our mundane concerns. In our community of women, we sit in a circle. Young unmarried women sit to the East. Women who have children or are over 25 years of age sit to the South. Women who have passed through menopause sit to the West. And Wise Women sit to the North. Whatever seating you arrange, be sure to reserve a place of honor for the New Woman’s grandmother and for grandmother figures. In most traditions, only women are present at moon-time rituals. The young woman’s father, uncles, or brothers, however, are invited to present congratulations and a gift (such as red roses) after the ritual is over. In our community, we do not invite girls who have not yet begun their menstruation to attend a moon-time ritual. This assures that the ritual will be special for them when their time comes. They may join the group when the circle is open for sharing food and friendship. Choosing the prayers for a ritual has to be done carefully. All generations and their beliefs must somehow be honored. This is not always an easy matter. If your tradition contains a concept of the Divine Feminine, now is the time to invoke Her. In our community, we sometimes honor the four directions, which serves as a way to honor nature. In many traditions, nature is considered to be the body of the Divine Feminine. To honor the directions, you can say something like the following: The East: The East corresponds to the element air, the mind, dawn, spring, pale, airy colors, the eagle and high-flying birds, and the power to know. Young women are keepers of the energy of the East. Their role is to develop their own inner strengths and talents. Welcome to the keepers of the energy of the East. The South: The South corresponds to the element fire, energy or spirit, noon, summer, fiery reds and oranges, and the quality of will. Artists, musicians, singers, writers, poets, gardeners, cooks, athletes, and especially mothers, are the keepers of the energy of the South. Their role is to create and nurture their families and their own personal creative projects. Welcome to the keepers of the energy of the South. The West: The West corresponds to the element water, emotions, twilight, autumn, deep purples, sea serpents, dolphins, and the power to dare. From the West comes the courage to face our deepest feelings. Women who have passed through menopause are the keepers of the energy of the West. Their role is to extend their nurturing to the entire planet, and to speak the truth, however hard to face. Welcome to the keepers of the energy of the West. The North: Because the North Star is the center around which the skies revolve, North is considered the most powerful direction. North corresponds to Planet Earth, the body, midnight, winter, black, and the green of vegetation. From the North comes the power to keep silent, to listen as well as speak, to keep secrets, to know what not to say. Wise Women and Medicine Women are the keepers of the energy of the North. Their role is to instruct and inspire the entire circle of women. Welcome to the keepers of the energy of the North. Raising the energy of the ritual can be done in a variety of ways: women can share their thoughts on womanhood, give blessings to the New Woman, sing, or do anything that appeals to the group. It is good to ask the ritual guests to prepare these things ahead of time. Following are some practices which are often a part of the women’s rituals in our community. In our community of women, we feel it is important to adorn the New Woman in some way in order to call attention to and honor the changes happening in her body. A flower crown or garland is often used. A crescent moon can be painted in red make-up on the New Woman’s forehead. Young girls especially enjoy henna temporary paint on their hands and feet. Henna is an herb that, when painted on the body, leaves a red/ orange stain that turns to brown in 24 hours, and lasts for about two weeks. Henna kits are available with instructions in gift shops, food co-ops, and herb suppliers. Make sure to prepare the henna at least three hours before the start of the ritual. And make sure the ritual guests include someone who is artistic or at least courageous enough to do the henna painting. Some groups of women paint henna lines down the inside of the New Woman’s leg. This practice is taken from the Hopi Dance of the Maidens and calls direct attention to the young woman’s menstrual flow. If henna is not compatible with your life-style, honor the New Woman with flowers, new clothing, or whatever feels right to your community. In some cultural groups, the New Woman’s hair is put into a bun for the first time in her life and covered by a small white cap. The bun distinguishes the women from the girls, who are still wearing their hair in braids. Gifts in these communities are often associated with the traditional women’s work of the community, or may be homemaking items that can be saved by the New Woman for her own home. Create your own way to honor your daughter as she enters womanhood. It’s inspiring at a woman’s ritual to hear poems or stories about women from your own community. Ask your friends and family members. You may find some unexpected poets or storytellers. Myths teach eternal truths through imaginary stories. They are time-honored teaching tools that you may enjoy incorporating into your ritual. Throughout this book I have included myths from around the world that teach important truths for young women. See the book list at the back of this book for more sources for mythology. This entry was posted in Sample Chapters. Bookmark the permalink.